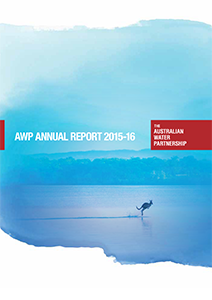 This report sets out the progress and achievements of the Australian Water Partnership in its third year of operation. 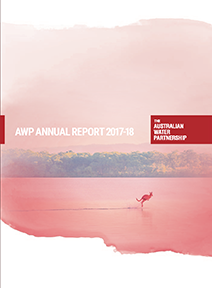 This report sets out the progress and achievements of the Australian Water Partnership in its second year of operation. 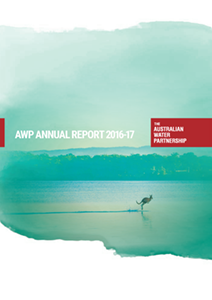 This report sets out the progress and achievements of the Australian Water Partnership in its first full year of operation since its inception in May 2015. 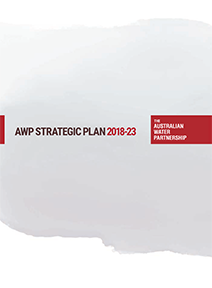 This strategic plan outlines the vision, mission and future directions of AWP for Phase 2 (2018-2023). 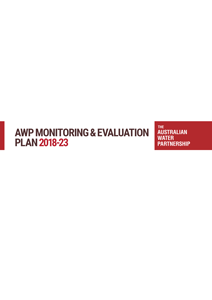 This plan provides clear guidance on how AWP will track and regularly assess progress towards outcomes and impacts during its second phase of funding (2018–19 to 2022–23). 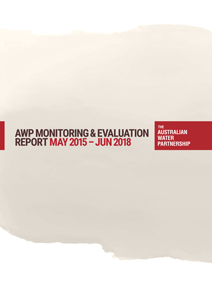 This report details the progress made by AWP in achieving its intended outcomes and lessons learned over its first three years of operation (May 2015 to June 2018). 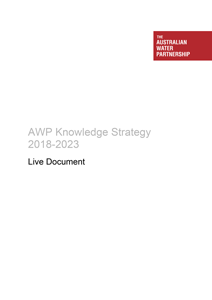 This strategy describes AWP’s approach to knowledge sharing and exchange, that articulates and promotes sustainable water management. 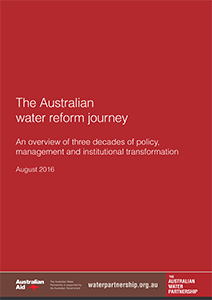 Traces how water policy, management and institutional arrangements have been transformed in Australia over the past three decades. Distils the key elements of the reform journey and lessons learned in conducting reforms. 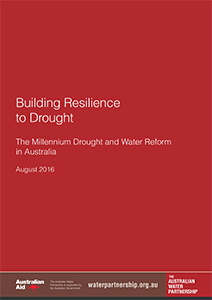 Australia’s Millennium Drought (1997–2009) severely tested new arrangements developed during a multi-decadal program of water reform and lead to a new set of arrangements for dealing with drought and water scarcity. 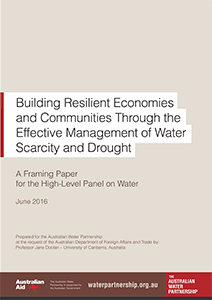 The drought ultimately played a key role in progressing water reform and building resilience to future water scarcity. Huw Pohlner, Simon Hone, Will Fargher, and Chris Olszak of Aither identify the state of global practice in valuing water, describe how valuation has been integrated into water management to achieve more efficient, equitable and sustainable outcomes, and provide options to spark global action within an SDG timeframe to improve water management by making more effective use of valuation. Professor Tony Wong describes how Integrated Water Cycle Management can be used to address emerging global water management challenges to do with urbanisation as populations grow, environments become degraded, climate uncertainty increases, and resources are constrained. Professor Jane Doolan describes approaches to managing drought and water scarcity for the 40% of the world’s population facing these problems. M. Grant, C. Huggett and J.Willetts explore how Sustainable Development Goal 6 and the High-Level Panel on Water Action Plan can significantly contribute to gender equality in both water resources management and WASH, and by doing so, will contribute to more sustainable and effective water management outcomes for all people, while decreasing the inequalities prevalent in many societies. WaterGuide by H. Pohlner and W. Fargher of Aither, is an organising framework for improved water management and use in response to scarcity. The first edition of WaterGuide was published by the Australian Water Partnership in March 2017 as part of Australia’s contribution to the High Level Panel on Water, and has since been used as the foundation for water policy dialogues with Jordan, Mexico, Senegal and Iran. 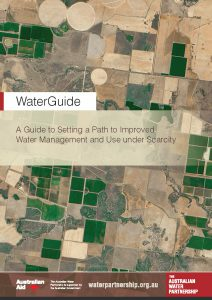 A newly released second edtion of WaterGuide improves the six-step framework based on its application for these countries, and demonstrates how it can and has been applied to improve water management globally. 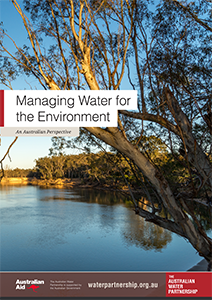 A Guide to Managing Water for the Environment, by Aither and the Commonwealth Environmental Water Office, offers practical advice for countries seeking to improve management of water for the environment within an SDG timeframe (i.e. by 2030). In many countries, the water demands of agriculture, industry, towns and cities are increasing year on year. As pressure on existing resources and the natural environment increases, water allocation and use decisions must acknowledge the fundamental importance of water for the environment as the basis for system health. This guide sets out elements that can be helpful when establishing or reforming related policies in any jurisdiction based on lessons from Australia and other countries. 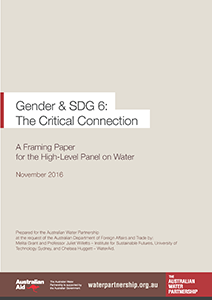 Gender Equality & Goal 6: The Critical Connection expands on the framing paper for the High-Level Panel on Water (HLPW), by Melita Grant and Professor Juliet Willetts of the Institute for Sustainable Futures, University of Technology Sydney, and Chelsea Huggett and Jane Wilbur of WaterAid. 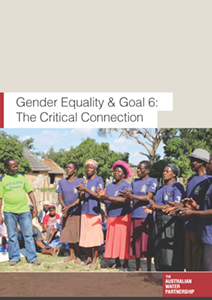 It includes additional content and delves deeper into Gender Equality and Social Inclusion issues – supporting AWP’s commitment to GESI – and focuses primarily on the HLPW Action Plan’s ‘Water Governance’ and ‘Universal Access to Safe Water and Sanitation’ themes. 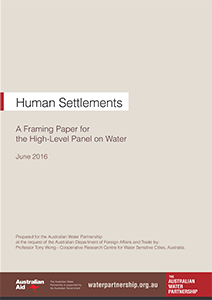 It identifies key areas of action for the HLPW, and other international development actors and governments, which can contribute to more sustainable and effective water management outcomes for all people while decreasing the inequalities prevalent in many societies. It also provides a range of case studies and outlines the implications for improving policy and practice. 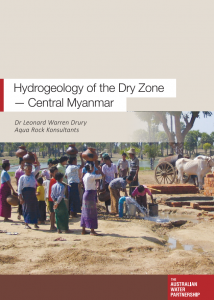 Hydrogeology of the Dry Zone – Central Myanmar, is a major study by Dr Leonard Drury, prepared with assistance from the Ministry of Agriculture, Livestock and Irrigation (MOALI). The study revises and updates hydrogeological surveys and a drilling program begun in the late 1970s to mid-1980s. It represents an understanding of the groundwater resources of the Dry Zone based on decades of experience from hydrogeologists from Myanmar and Dr Drury’s extensive international experience (read full summary). 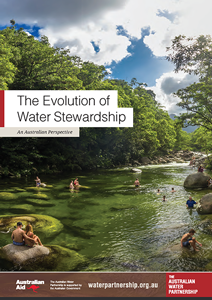 The Evolution of Water Stewardship: An Australian Perspective tells the story of a concept catalysed by Australia’s Millenium Drought which eventually develops into a global system for managing water risks and for collaboration between business, government and community. AWS Water Stewardship provides a roadmap for industry, agriculture and all non-domestic water users to adopt good water stewardship, which seeks to achieve four outcomes: sustainable water balance, good water quality, healthy important water-related areas (ecosystems and cultural sites), and good water governance. The AWS Standard is the only freshwater management standard that meets the requirements of the ISEAL Code of Practice for Good Standard Setting, the global benchmark for credible sustainability standards.